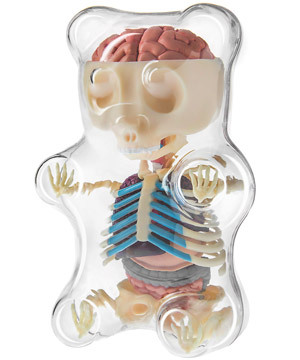 Created by pop-culture artist Jason Freeny, the do-it-yourself model features a snap-together skeleton, detachable organs, and even a removable skullcap for viewing the Gummy Bear's brain! Dimensions: 8.5" x 5.25" x 4"
Gummy Bear Skeletons. Gross. I want one. Artist Jason Freeny is well-known for his anatomically creepy pop-culture sculptures. While most of his works are one-offs, he recently partnered with a toy company specializing in 3D anatomical models to create the Gummy Bear Anatomy Model. It looks like a gummy bear, but it's got a skeleton and organs! I know I shouldn't, but I want to eat it. But it's not edible. So I'll keep it on my desk and enjoy the hilarious reactions of others. Adorably hair-raising miniature animals are definitely our thing. Detachable organs and removable skullcap! We're not quite sure where Gummy Bears lie on the tree of life, but according to their anatomy they share a lot in common with your common bear. I guess that makes sense, but it sure makes for a lot of de-boning prior to consumption! The 8.5-inch tall Gummy Bear Anatomy Model contains 41-pieces including a complete skeleton, brain, heart, lungs, digestive track, and liver. All of the organs are detachable, and a removable skullcap makes for easy viewing of the brain. Yummy! 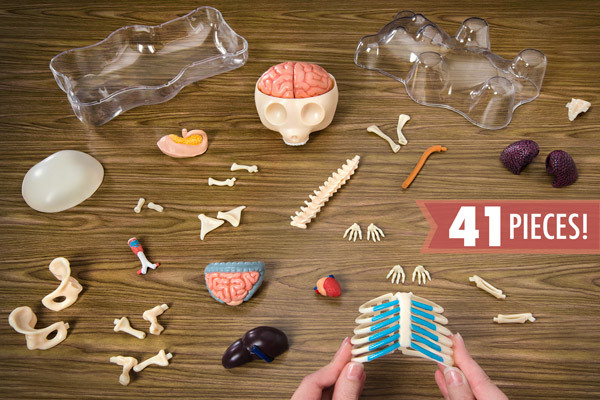 The Gummy Bear Anatomical Model contains 41 adorable body parts. Just look at this little fella. Who would've thought tasty gummy bears were filled with so many bones and viscera! After you've put together your model, display it in the included plastic case. Answer: No, but this is. And so is this. Oh, and so are these, these, these, and yep, these, too. 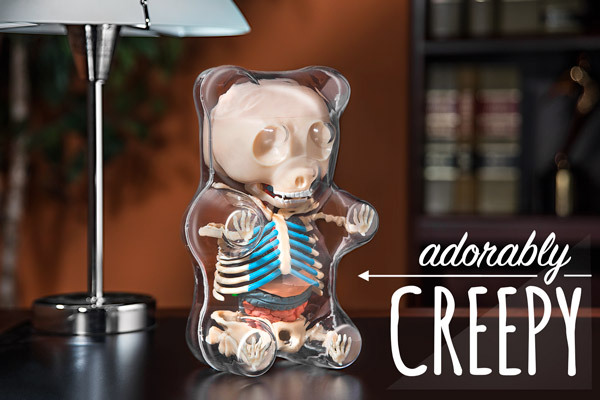 The Gummy Bear Anatomy Skeleton is a different animal (so to speak) than our edible gummies. Question: Is it difficult to put together? Answer: No, not at all. The included instructions are very clear. It'll take you about 25-30 minutes, depending on your skill level.